On this Valentine’s Day weekend—which also marks the opening of the Orchid Show!—we share two tales of love, both about the same ravishingly beautiful flower, commonly called the Lady’s Slipper Orchid. The first story has its roots in the ancient Greek myths. Flower legend says that the goddess Aphrodite (Venus to the Romans) was out hunting with the handsome mortal Adonis, when a powerful storm forced them to seek shelter together in a cave. Love ensued. Post-storm, the lovers ran off—Venus, minus one slipper. A mortal human came across the shoe and reached down to pick it up, when suddenly and magically it transformed into a flower with a slipper-shaped petal of gold. 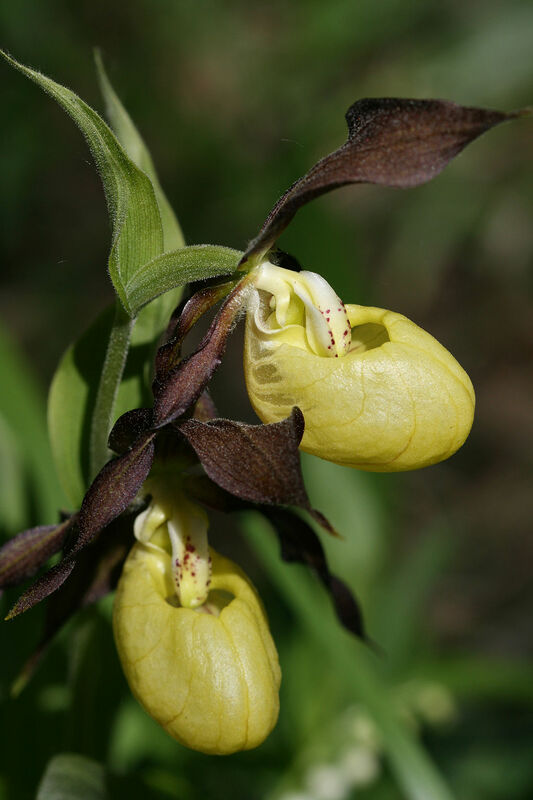 The Lady’s Slipper orchid’s beautiful binomial (two-part) Latin name, Cypripedium calceolus, was given it by none other than Linnaeus himself (Carl von Linné), who listed it in Species Plantarum in 1753. The great botanist packed a lot of meaning into that name: Cyprus was the sacred island of Venus’s birth, pedilon is the word for slipper, and calceolus means little shoe. 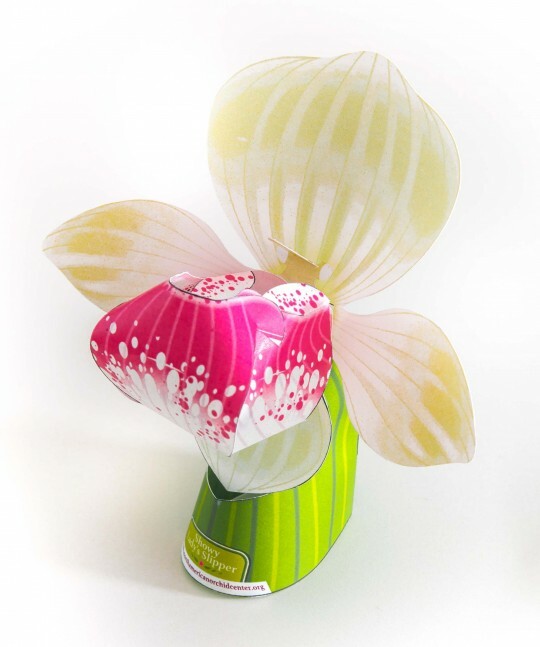 The Lady’s Slipper orchid is native to a broad swatch of the temperate world, from Europe through Asia. While still common in some wild areas, the orchid’s beauty has made it over-loved in others—it is now considered extinct in Greece, the very home of its ancient legend. And that brings us to our second love story. The flower fervor that swept through Britain in the nineteenth and early twentieth centuries not only raised demand for the exotic plants of the world but also took a toll on the native plants of the English countryside. Loss of habitat and over-collection by humans diminished the native Lady’s Slipper Orchid’s numbers until, in the early 1980s, just one plant remained in the wild in the entire country. 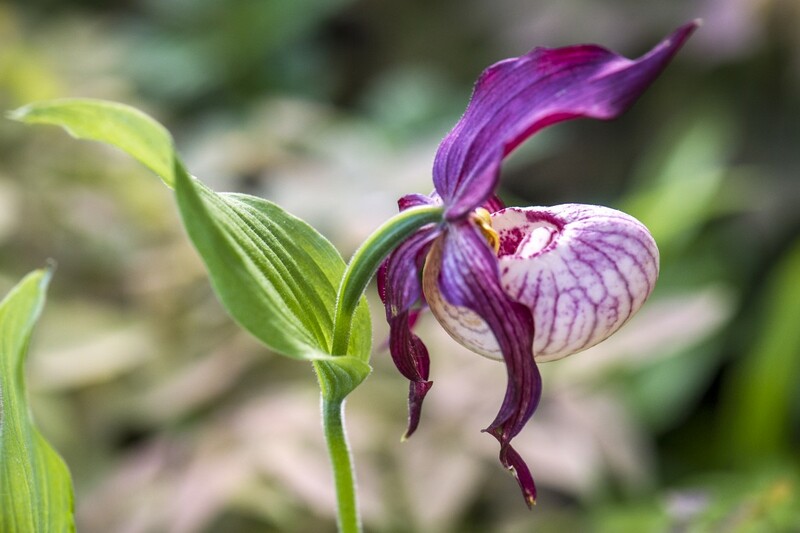 Make your own lady’s slipper orchid—no watering required! Just print this 2-sided template from the NAOCC, cut, and fold! Placed under last-resort protection, it was nurtured along until it gained strength and eventually bloomed. Its seeds were collected and sent to Royal Botanic Gardens, Kew, where a conservation program was put into place. Eventually, the difficult-to-germinate seeds germinated. Seedlings, which take 5 to 10 years to flower, have since been re-introduced into the wild in an attempt to re-populate the species there. This modern-day love story has devotion and commitment and conservation at its heart. At the Orchid Show, you’ll learn more about the orchid conservation efforts that the Chicago Botanic Garden is committed to—including the work of the North American Orchid Conservation Center, which sponsors a terrific website about our continent’s native orchids at goorchids.northamericanorchidcenter.org. This Cypripedium Gisela lady’s slipper cultivar can be found blooming in the Heritage Garden in late May. While there won’t be any Cypripedium calceolus plants in bloom at the Orchid Show (they’re terrestrial orchids that don’t bloom until spring), lots of other slipper orchids in the Paphiopedilum and Phragmipedium genera will capture your imagination and attention. Take a selfie with your favorite and share it #theorchidshow @chicagobotanic. Hashtag your favorite orchid #cbgOrchid16 to enter our Instagram photo contest. Want to learn more about orchids? Read our blog posts! And have a Happy Valentine’s Day, everyone!